You are here: Home / Investment / How does Systematic Investment Plan work? That was really nice. Have one small clarification. How do we make profits in equities in the long term ? what is the strategy behind it ? does it involve compounding and if so how ? 1) Dividends. Good companies give part of the profit earned as dividends every year. 2) Capital appreciation. Say you bought a company’s stock when it was Rs.100 and after sometime it performed well and rose up to Rs. 200. Your total value invested has doubled. There are companies which can give such multiples of return on investment, also there are companies which can erode your investment. It depends on which company you have invested in. There are ways to analyse a company on the basis of how good and fundamentally strong the business is and the right time to invest in it. Will be writing more about these techniques in future posts. Great Thanks … will wait to know more then 🙂 … just a QQ… I am planning to invest in NiftyBees monthly for rs 6000 (i.e. around 10 scrips a month) for a period of 10+ yrs. Do you suggest it is a good move and worth doing so ? With the above said, just for the sake of math, at the end of 10 yrs, i would have invested around rs 720,000 to rs 750,000 with around 1200 scrips totally. I am aware that we cannot justify or expect anything precisely. Is it poss to analyse determine what would be the total earned at the end of said 10 yrs at the rate of 12% for the above? Thanks … . We can’t predict how the markets will move in the future. But if you want to know how the monthly investment would have worked for past historical data, you can goto this page http://www.moneycontrol.com/mutual-funds/nav/goldman-sachs-nifty-exchange-traded-scheme/sip-calculator-MBM001.html and put in your numbers and you will get the current value of your investment. 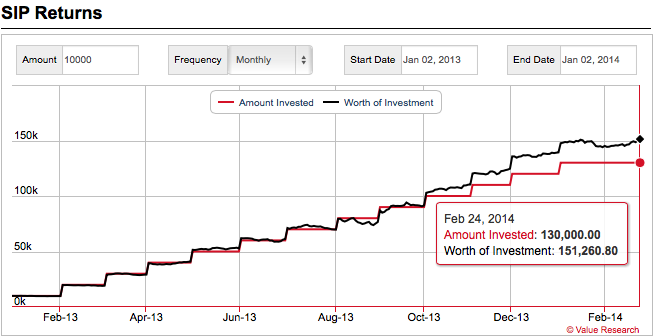 Eg: putting in your example from Feb 2004 – 2014, investing 7.2 lakhs grows your money to 12.38 lakhs. Investing monthly in Nifty BeES is a good and safer way to getting your feet wet in equities market. Do remember, the longer you keep your money in the market, the higher the returns are. So, if you invested for 10 years and didn’t even put in a single rupee in the market after that, you will get a nice profit by the time you retire (assuming you are pretty young now). Great Thanks … That was awsome…. QQ… So investing till 10 yrs and not investing after it; and not taking the money from it post 20 yrs(total 30yrs), will the money in return grow compounding or will only raise as per the scrip value ? Thanks …. If after 10 years you have 1000 units of Nifty BeES, your investment grows as long as nifty grows. For example, in 20 years from now nifty bees is at Rs.2000 (assuming nifty is at 20K), then your investment is 1000*Rs.2000 = Rs.20 lakhs. Best part is since its a long term investment, you don’t have to pay tax when you sell this. If you keep investing more or higher amount as your salary increases, you will get even higher returns. Overall compared to any other form of investment (FD/PPF/etc), equity markets provide higher than average when invested for a long term. Have one small clarification. How do we make profits in equities in the long term ? what is the strategy behind it ?any formluaes? does it involve compounding and if so how ? Its just like everywhere else. Profit = Selling Price – Cost Price. Profit is Rs.500 – Rs.100 = Rs. 400. Now where does compounding come into the picture, you might ask. It is built-in to the business. You should remember a stock is buying a share of the business and not just a piece of paper/a line in DeMat account. When the business is doing good and earning nice profits, it will take part of the profit and put it back into the business to grow it. Your investment automatically compounds as long as the business makes profit. Thanks you very much sir and i have really missed this. I currently have an India Info Line and have closed this third party stock broker. I m planning to open the demat with the ICICI. Just wanted to confirm if they are good and its transaction percentage is par with their counterparts. And any additional charges they imply on us, As said, planning to have the NiftyBees and any other C category scripts (i.e. around 50 or 100 Rs) that you would suggest for ? I don’t know the difference in brokerage rates between ICICI vs other third party brokers. But usually I don’t prefer these bank+brokers. I had a SBI 3-in-1 account and the software support was (is even now) terrible. Also the brokerages was almost double than what I got from a third party broker. Also you can easily negotiate better brokerage rates with third party brokers than with banks. As far as brokers are concerned, as long as they are registered brokers everyone comes under SEBI. No one can cheat you and go off. Just see which broker gives you good software support and good connectivity/telephone support to trade. Most big brokers give that. If you are feeling jittery about 3rd party then stick with your plan of ICICI. Except for the brokerage, all other taxes (STT) & education cess and stuff are fixed by the government. They can’t charge more on that part. Just try to negotiate a good brokerage rate if you trade often. “The famous example always given is “if you bought 100 shares of Wipro for Rs. 100 each (Rs. 10,000 investment) in 1980s, it would’ve grown more than Rs. 395 crores by the year 2010.” Phenomenal growth by just staying invested in 30 years”. Just curious to know that how it made that much amount ….. For ex- total value during its inception is Rs 10,000 and now it say one scrp it goes around 500, it should be 500*100=50000Rs or increasing by percentage also it would be a couple of times doubled, but dont expect to come to 395 crores. So wondering how and what made that big amount … any insights ? I will post it as an article with the exact numbers of how it grew so much.